“Meditation is bringing the mind back home, and this is first achieved through mindfulness…Once an old woman came to the Buddha and asked him how to meditate. He told her to remain aware of every movement of her hands as she drew water from the well, knowing that if she did, she would soon find herself in that state of alert and spacious calm that is meditation.” -Sogyal Rinpoche from “The Tibetan Book of Living and Dying”. On a bright sunny day, the new volunteer and I spent 2 ½ hours climbing the steep hill to the monastery. When we arrived, we found the place in a state of busy commotion. Sherpa women had taken over the kitchen while Cook and many of the other monks were busy working around the grounds. The monastery had begun to prepare for their visit from the high lama, which marks the beginning of the Dumje Festival. The High Lama Dagri Rinpoche, travels to all the monasteries in the region during the summer; the Dumje Festival follows him and takes place wherever he is. Tired from our climb, we headed to the kitchen and set our things down. Almost immediately, there was in front of us, the bottomless cup of milk tea we’d come to love. In this region, it’s everywhere, and it is not uncommon to have drunk 6 cups before lunch. 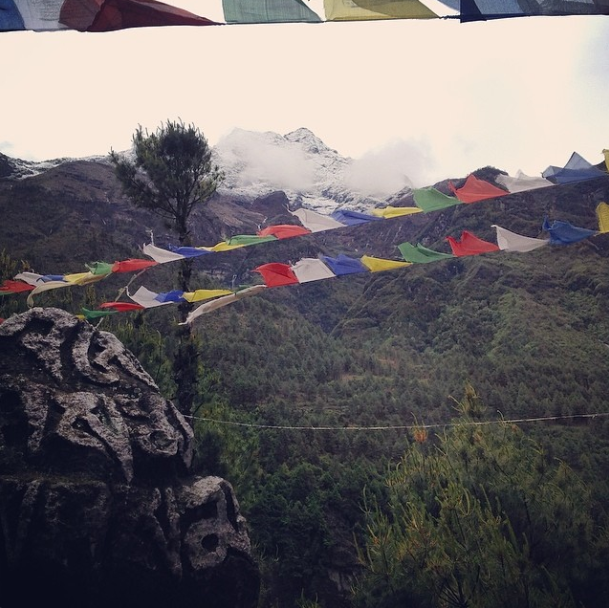 It was midday and the drums, chanting, and bells of puja (prayer) could be heard on the mountaintop. Normally, puja only takes place in the early morning and in the evening, but today, practice has started in preparation of the festival. Curious, we hung in the doorway trying to see what was happening in the sacred prayer room, when the Sherpa woman in charge invited us in. What a huge honor! We were now right in the middle of a very special puja session with all the senior monks, a few nuns from a nearby monastery, and a select few young monks. We were ecstatic to be allowed to participate. As we joined the monks, we took up the lotus position on the long low benches that ran the perimeter of the room. The air was thick with incense and the very low monotone chanting of the monks. Bright colored cloths covered the walls and ceiling, and were accompanied by many pictures of lamas wrapped in prayer scarves called katas. On the back wall sat a huge gold statue of the Buddha in lotus position. He took up the majority of the wall from floor to ceiling and was surrounded by incense, flowers, milk tea, pictures of high lamas, katas, and offerings of food and drink. As the monks chanted mantras, the Sherpa women would come in, get on their knees, slide their hands forward on the ground until they were lying down, rise, and repeat. Then they would come and pour steaming milk tea in everyone’s cup. I was told when it comes to monastic life, some monks put all their effort into becoming enlightened beings, while others spend the majority of their time doing chores and helping around the grounds. I knew immediately which of my young monks were following the path of the Buddha, and it was an absolute honor to be allowed to participate in the rituals of those actively seeking enlightenment. As we sat cross-legged I remembered that this was the chosen position because it is considered rude to point your feet at people, and especially at the Buddha or the pictures of the Dalai Lama and other lamas. Despite the pain in my hips, I was able to center myself and do some meditation. What an incredible experience to get control of the mind and thoughts, and meditate in the midst of these Holy Beings in their best form, chanting mantras that have existed for thousands of years! Every hit of the gong and drums shook the thin air to vibration, and the rays of sunlight seemed to beam brighter as they made their way through the old dusty windows, the lingering smoke of incense, and the steam of the ever-present milk tea. Even an outsider stifled by ignorance could feel the sacred abundance of life and ritual here. I am still sick and sitting very still in the sunny yard, watching the wind push the clouds above while it moves my hair, my clothes, the grass, and everything around me. Suddenly, the other female volunteer comes running into the yard, rushes up the steps, then pauses for a moment and asks what I’m reading. After I reply, she says, “That’s great! Wish I had time to read!” then runs up the rest of the steps and disappears in a hurry. I think to myself ‘Yes, but I am here to be still and reflect, what are you here for?’ I have begun reading “The Tibetan Book of Living and Dying” by Sogyal Rinpoche. It talks about something he calls “active laziness” which manifests in very different ways depending on the culture. In the West, we keep ourselves so busy and bustling around, that we never have time to reflect, thereby avoiding our fears. The tragic side effect of this habit, is that we also rush through all the beauty around us, the wonderful moments as well. Most often we miss them completely, thinking we’ve arrested our minds and bodies long enough to participate, but because we’ve not actually trained ourselves to slow down, we are not actually able to do so. That is why the Tibetan masters refer to Westerners as “beautiful living corpses”. In 2008 I read a series of ‘based on real story’ books that were part of the “The Way of the Peaceful Warrior” saga, written by Dan Millman. The series was accompanied by self-help books. At the time, I had no idea that the thoughts and practices were born of the Buddhist philosophy and tradition. I followed exactly the suggestions, and it was one of the most peaceful times in my life. It is said that once the concept is grasped, it is not uncommon for one to lose hold of it, and that I did. Not knowing where the ideas had come from, I had no way of pursuing further knowledge, but there were some meditation apps on my phone and I started using them. Over the years, I slowly started becoming aware of traditions that included masters and enlightened beings. Then, in a required Comparative Religions class that turned out to be absolutely amazing, I was introduced to some of the religions to which these philosophies belonged. 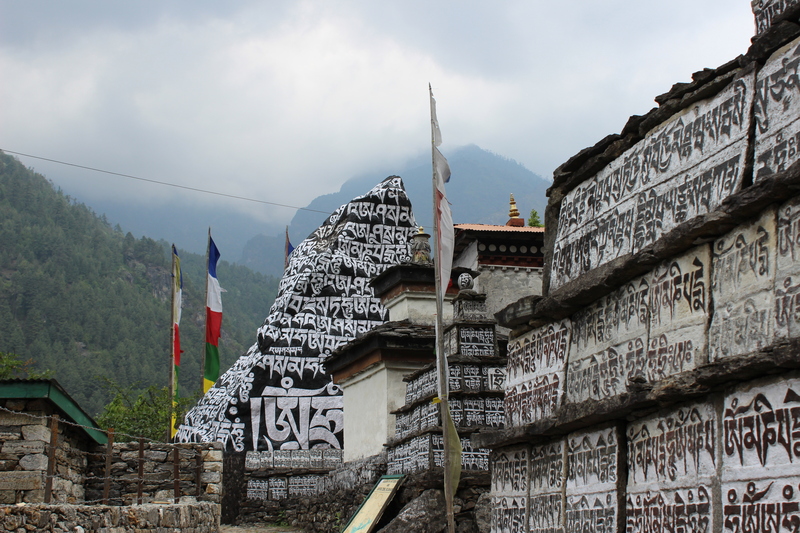 Long story short, I wound up in Nepal studying Eastern Philosophy and some of the religions and cultures it lives in. According to Tibetan Buddhism, there are two fundamental parts of the mind. The Ordinary Mind (Sem in Tibetan), and The Nature of Mind (Rigpa in Tibetan). The other fundamental part, The Nature of Mind (Rigpa), is a little more difficult to understand. It is the part of the mind that looks inward. Sogyal Rinpoche says Rigpa is “Simply your flawless, present awareness, cognizant and empty, naked and awake.” I understand it as the moments of clarity, the epiphanies that come through when all the mental noise stops, and the feeling and wisdom you experience when you are truly one with what you are doing, but I am a novice. 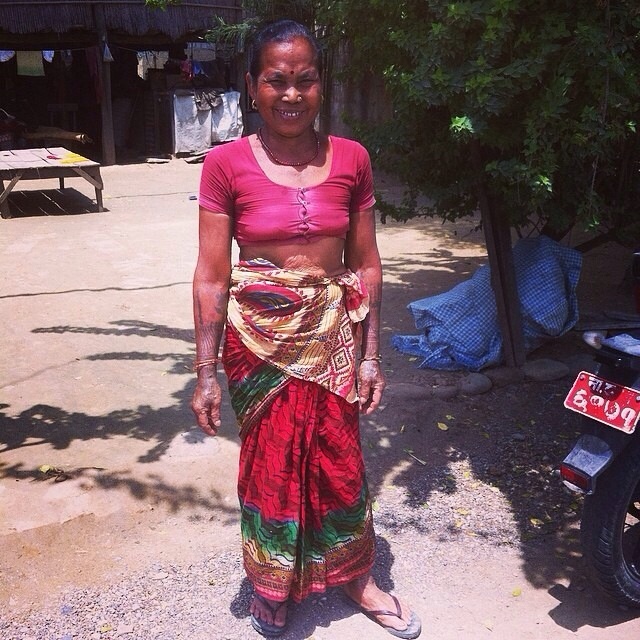 Wild Rhinos, Indigenous Tharu People, and Dysentery! Better known as the day I got Amoebic Dysentery, heat stroke, and was relieved of my phone and all communication with the outside world. 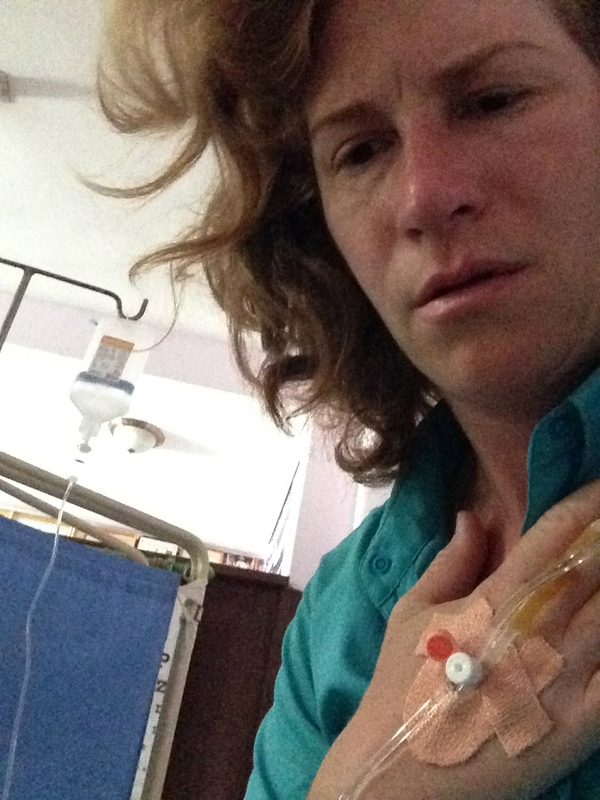 Don’t worry, I’m on the mend – up and walking around with a good bit of energy restored. I got very lucky and had the most wonderful, amazing doctor! 5am: I’m not feeling my normal self, but drag out of bed to the jungle walk anyway. 2 guides, 2 Americans, and 3 Chinese go lurking through the jungle in Nepal early in the morning. The ungodly heat has not yet enveloped the day and we are bright eyed with the prospect of real wild life. 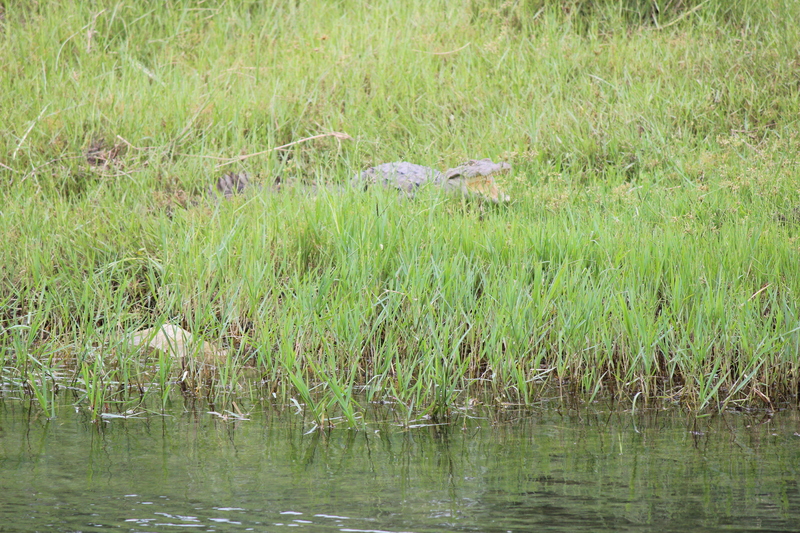 A crocodile sits on the opposite bank of the river. There are long and short nose indigenous crocs in the region, the latter being rather fond of human flesh. As we go creeping along a well-worn path we are entertained with whispered stories about the demise of guides. Just last week, a wild elephant bull killed a guide. A week before that, a guide had a group who was interested in water buffalo herds. Water buffalo are rather tame and in many parts of Nepal, are kept as domesticated pets who provide milk and cheese. Behind the water buffalo herd was a mother one-horned black rhinoceros with her baby. The guide failed to notice her, was speaking in a very animated manner, and ended up paying with his life. We hear some rattling and something drops from a tree: monkeys. Through the Tarzan worthy vines and tropical trees we see the very still bodies of spotted dear. As we move clumsily along the trail, the heat starts to press down through the shade of our thick green canopy. Suddenly, we are stopped and silenced. A few yards from the trail on which we stand, there is a swampy looking pond covered in lily pads. 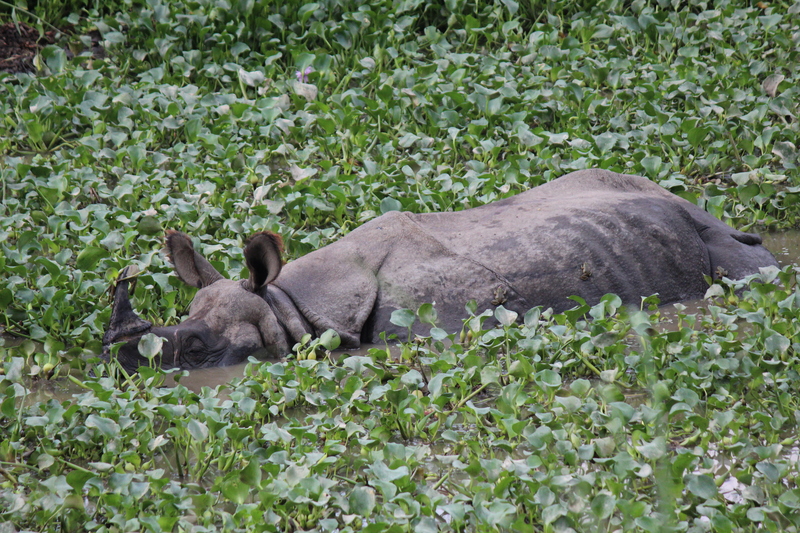 Staring at us from the edge of the pond is a huge black one-horned rhinoceros and her baby. Is this the one? In the middle of the pond there is another, mostly submerged rhino trying desperately to escape the heat, which is just beginning. 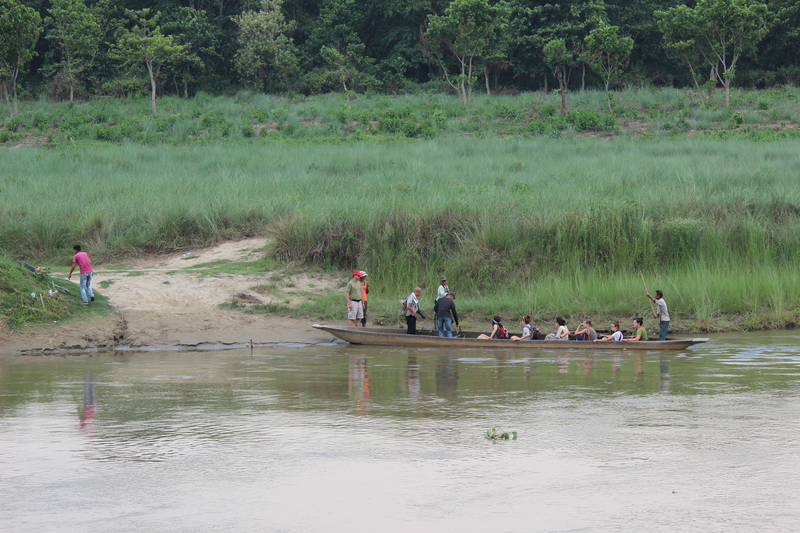 7am: The seven of us jump in a long wooden canoe with a driver and head down the river. One of the sides has somehow lost a few inches and makes me a bit nervous as I watch the tainted water ride a few centimeters from the top. There are definitely some landlubbers in this boat and it starts to rock as they make jerking movements from side to side! Aaaahhhh! With cameras poised, they lean against one side or another throwing our balance off. The water comes pouring over the short edge! As it is, we are sitting really low and have literally a few centimeters of wood keeping us from going down. The guides speak firmly and say not to make such an easy meal for the crocs. Egrets and cranes fish in the tall swampy grass next to shore and we see plenty of kingfishers emerge from holes drilled in the sides of the banks. We go through some rapids, but make it to shore without too much incident. 11am: I take a stroll around town and end up making friends with a bunch of old ladies. 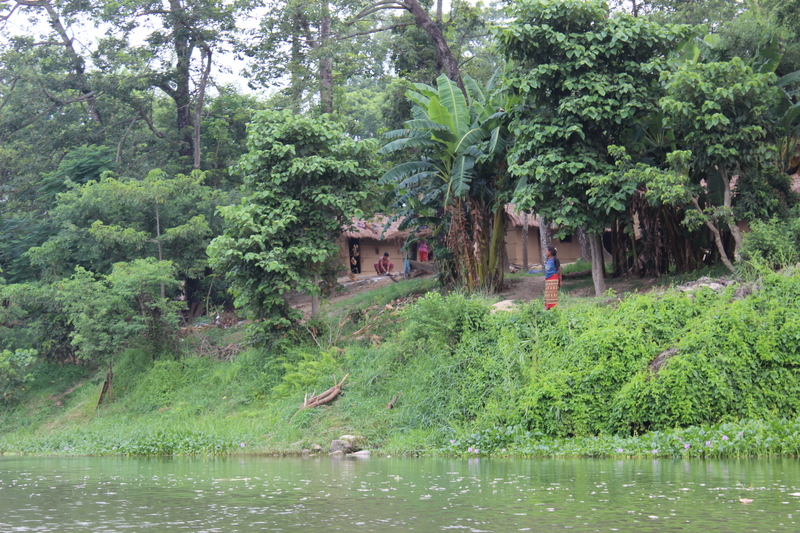 The Tharu are an indigenous people here. 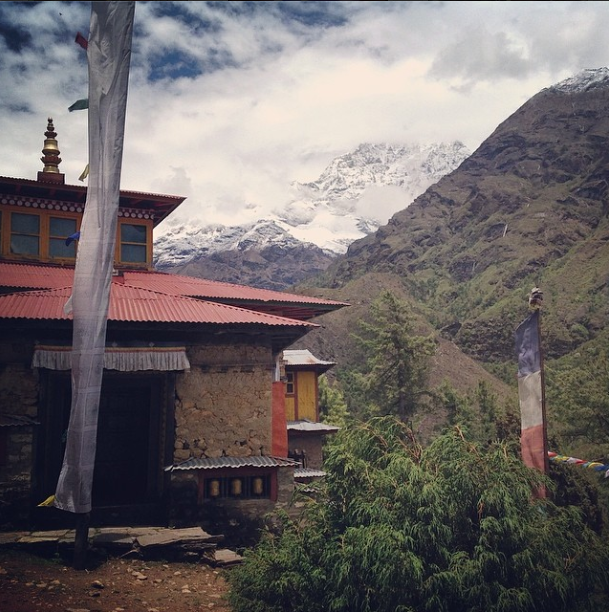 They migrated here some 350 years ago from India, but like the Sherpas, nobody knows why. They inhabit the entire terai region of Nepal, which spreads from east to west in the southern part of the country that runs alongside India. This area was wrought with Malaria until 1951, and the Tharu were the only residents, as their entire culture is unaffected by the disease. It’s now harvesting season and many people are in the streets preparing their crops. 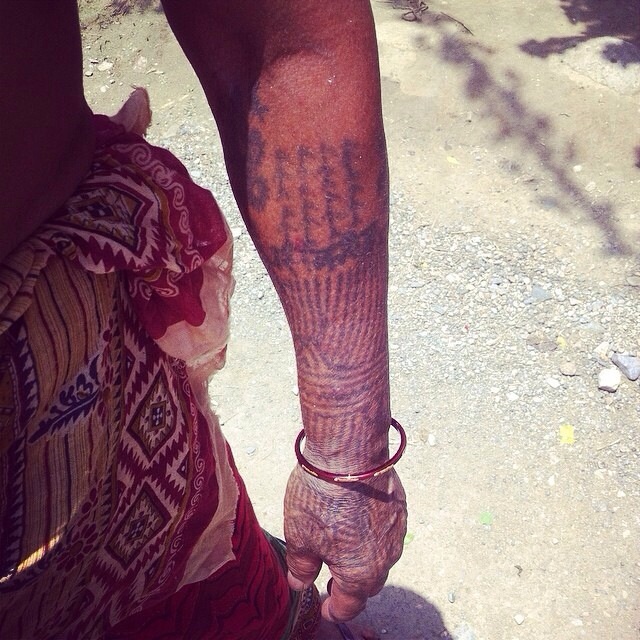 The older women all wear traditional tattoos from their hands to their elbows, and from their feet to their knees. This is how I make friends. We have very little way to communicate, but we are smiling, laughing, and inspecting each other’s artwork. They are more than pleased to take pictures with me, and they are beautiful. Compared to most Nepalese, the women are very dark with big bright smiles. They are adorned with lots of jewelry and the most gorgeous clothes. It does not matter whether they are going to work in the field or in the kitchen; they dress to the nines in their traditional clothing everyday. I can’t explain how beautiful, warm and welcoming they are. 12pm: I am ecstatic over discovering this indigenous people and the new friends I’ve made, but I am beginning to feel extremely weak so I rest. 3pm: Elephant safari time. A very fast ride in the back of a pickup over fields renders me unmovable. The gas fumes are overwhelming. I can’t ride the elephant much less stand. After returning very ill to the hotel, I tell the owner and manger that my phone came out of my pocket in the truck and could he please get it. I’m going to rest; I don’t feel well. 4:45am: the birds start chirping and light begins to move into the sky, comfortable like an old friend. The 1st recognizable image I see is the very top of a Himalaya covered in snow. I turn, and two minutes later, it’s gone. It’s huge magnificence totally hidden in a cloud as if it just disappeared, never existed. Then, in the distance a giant mass of white moves into the valley. I mistake it’s eery presence for smoke from a chimney, until I’m shocked into realization by the sheer size of this thick white mass. As my attention moves across my plane of perception, I’m almost startled and delighted at the same time, by the bright pink geraniums just feet infront of me. During the day, they are almost unnoticeable, but now, against this massive white and grey canvas, they jump out, almost scream out as if the whole picture was being seen through a lens with a color filter. Now time for my Sherpa breakfast! A cup of better tea, chhampa porridge (kind of like cream of wheat with rice), Sherpa bread and jam, and two slices of yak cheese. Then shaky legs please carry me, to the morning puja (prayer) that will kick off today’s leg of the festival at the Lukla monastery. note: there are several blogs prior to this that I need to type and post. Awesome first day at the monastery! Two and a half hours straight up the side of a Himalaya in the rain. I didn’t fall off and I made it to the monastery! The view is phenomenal and the young monks are amazing: very eager and curious. I am so super happy! There’s an Aussie volunteer named Dane, who will be there about the same amount of time I will, and I think we’re gonna make a great team. Apparently we will be teaching math and geography in addition to English…good thing I brought a world map. Dane is living at the monastery which will help us get to know the monks better, as he’s able to quiz them on the lessons all day long. As soon as I get used to the route and the altitude I will be staying later to participate in their puja (prayer) and meditation. At this point I think I’m doing very well, but 5 hours of strenuous exercise in high altitude is requiring extra sleep and lots of electrolytes. I don’t think it will take me long to get acclimated though, and when I get home I’ll be in hellacious shape! Right now, I’m more than thankful for the lung capacity that trombone playing has given me, and the sure-footedness I acquired running canyons. I think some balance left over from skateboarding days also lends a hand here. So…I am able to do my assignment as planned! But, I found out that the other volunteer ran into the same difficulty. He was supposed to be at the monastery 12 weeks, but was held at the school and orphanage for over a month, AND had difficulties when he finally put his foot down and said he must head to his assigned project at the monastery. So apparently this has been happening with everyone. I do want to say though, that this is an isolated incident, and I have not heard about anything like this happening at any of the other posts throughout Nepal. I also want to say that I have found the Sherpa community to be incredibly honest and giving, and can see that this problem is arising because the host family has their heart in the orphanage and school, so naturally want everyone to experience it. I have watched the smiles spread across their faces as they approach the place.